University of Houston Law Center student April Soto will begin her 3L year when classes resume in August. 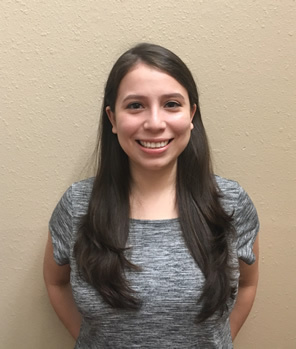 June 19, 2018 – April Soto, a third-year law student at the University of Houston Law Center, strives to give back to the people of her hometown during a summer fellowship at BakerRipley. BakerRipley is a non-profit organization that provides educational and employment opportunities, health care and other needs for low-income neighborhoods, families and individuals. Soto is working at BakerRipley's Gulfton neighborhood center in southwest Houston. During Soto's first year of law school, an information session was held by the Hispanic Law Students Association where she attended a presentation about BakerRipley. Following the devastation of Hurricane Harvey, Soto pursued opportunities to work with the BakerRipley because of the organization's capabilities to provide relief. "I was taught to give back to my community whenever possible and law school has given me the unique opportunity to help solve the problems that affect people's lives on a daily basis," Soto said. Soto began her internship at the end of May. With immigration being a personal issue to Soto and her family, she has seen how important it is to sufficiently inform people of their options. "I do everything from preparing naturalization and DACA applications to helping put together asylum and U-visa cases. I spend some portion of every day translating testimonies, USCIS interviews and client questions," Soto said. Prior to law school, Soto was a paralegal at a foreclosure law firm, which inspired her to gain a more complete understanding of the legal system. "I decided to get the full law school experience," Soto said. "The Law Center was a good fit because I knew I wanted to practice in Texas." Soto wants to learn more about establishing a trusting and honest relationship with clients by working with them directly while at BakerRipley. Soto hopes to gain more working experience through clinic work in her last year at the Law Center. She looks forward to helping those who may not have received the same opportunity of attending law school.